Ubisoft just showed off yesterday the second game of the Watch Dogs series in their livestream. We will now take a further look at it and list averything we know already about the gameplay, the new charakter, the new location and more. 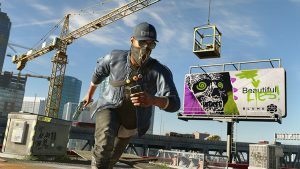 Watch Dogs 2 is the sequel to the first game released in 2014 by Ubisoft. It was already known since some month that the game would probably come out this year and now it was officially announced in a livestream by Ubisoft. We can say one thing in advance, the game will officially come out this year, namely November 15 2016. Now we will show you all that is already known about the game. As the leaks earlier this year already suggested the game will take place in San Francisco, more specific in the San Francisco Bay Area. 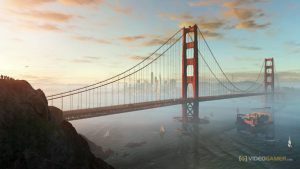 That means that the player has the option to visit San Francisco but also the areas around it such as Oakland in the open-world game. As we have seen in the trailers, the city will consist of a more colourful enviroment and iconic sightseeing spots like the Golden Gate Bridge, Fisherman’s Wharf and the Coit Tower. The AI of the citizens was worked on and so they will now interact actively and better with their environment. 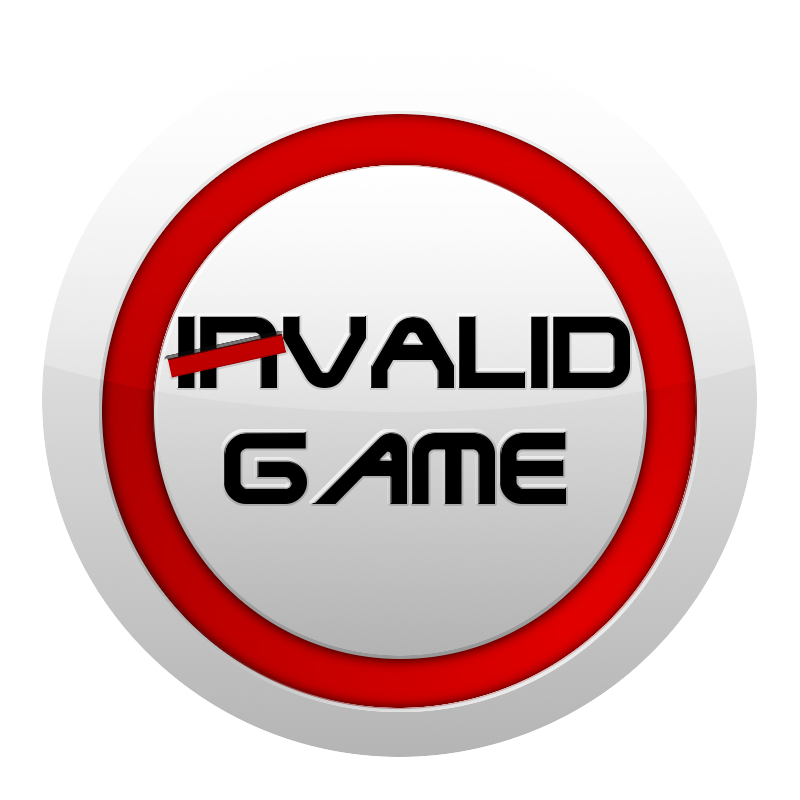 That means that they will for example call the police without any action by the player. Or that a dog will randomly chase people. Also the types of characters will differ between the different town districts. This should help to create a more real-life situation. The game world will be 2-2.5 times bigger than the world of Chicago in the last game. Also it will be completely open to the player from the beginning on. 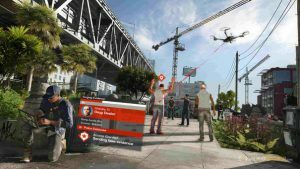 There will also be many different activity such as drone or boat races in the world but you can also go around and find hidden collectibles. As in the first game, we will have the possibility to drive tons of different vehicles like cars, motorbikes, our drone and even different boats. The new main character will be the smartly and young Marcus Holloway who comes from Oakland. There is the possibility to change his clothes like in GTA and there will be many different clothes to choose from. Marcus is a genius young man who was always interested in programming. One day he is falsely accused of a crime and to find out why this happened, he starts hacking and is discovered by the hacking group Dedsec. He joins them and at that point the history of Watch Dogs 2 will begin. He also is very sportive and a good parcour runner this helps him to get around in the city, but also helps his fighting skills. Dedsec is a hacking group which stand in the middle of the story, a group of hackers that rebel against criminal companies and so save the civil rights but also have fun. Their goal is to get to know who stands behind all the huge companies and why the are for example corrupt. The game consist of many different missions and quests which will not all lead to the finish of the game. As we already said, the fighting is based on the parcour skills of Marcus. That means that fast attacks and fights are important to the game. As a melee weapon Marcus has a self made slingshot weapon which consist of a billiard ball that is connected to a rope. The weapons we can use are 3D printed by Dedsec and this process will be upgraded over time. To upgrade weapons and objects, we need to find collectibles that can be found all around the game world. The game can also be played in a stealth mode without killing, as a taser-gun was added to the game. We can also use weapons of our enemies, but we can’t upgrade them. In the game we have two different drones that help us. On the one side a flying drone which acts like a camera in the sky and on the other side the so called ‘RC Jumper’ a small driving drone. There will be a skill-tree with over 50 upgrades for our player and weapons. We get skills, by activities we do in the game world and that help Dedsec. We can also buy cars an let someone bring them to us. Our character has also a Smartphone with many different apps that can help us. In the game we now have the ability to hack anybody in the world of San Francisco. Objects in the world have now up to four different actions that can be triggered by hacking them. Vehicles can now be controlled and driven, by hacking them. A new hacking feature is the mass hacking, in which the player can hack a big group of people at once. We know have the possibility to decide how we will play a mission. That means that we can decide if we just shot everybody, tranquillize them or hack them. The game comes with a complete co-op mode in which a player can join another player and play missions together. Online we have the possibility to do different gestures to communicate with others. 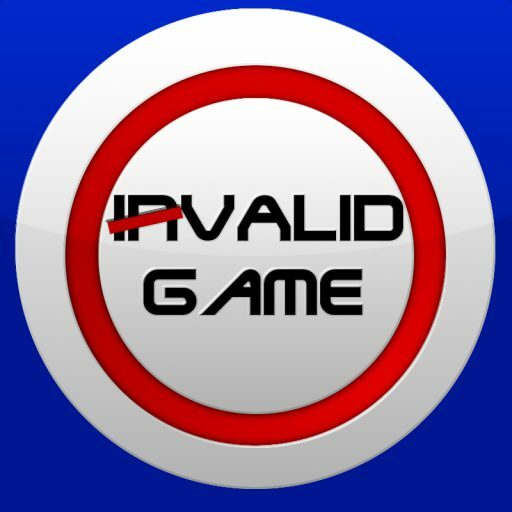 You can also play the game in private mode, so no other people can join you. the articles is truly great :D. Good job, cheers.